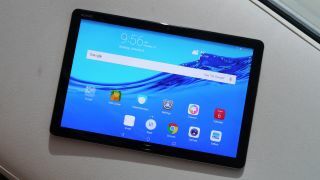 At CES 2019 and almost a year after introducing its MediaPad M5 line of high-powered flagship tablets, Huawei has added another: The MediaPad M5 Lite, a slate with slightly lower specs aimed to entertain kids (and protect them while they use it). While not much was changed in the external design – it looks nearly identical to last year’s models – the M5 Lite, unveiled at CES 2019 has been optimized for its role through software. Kids Corner is a contained environment with cutesy animations and only a handful of simplified apps to draw, take photos and look at a media gallery. Youngsters can log in with their fingerprint, which takes them directly to the Kids Corner, which they can’t exit without a passcode (keeping them out of the rest of your apps and the internet proper). The tablet will also nudge young users to keep the tablet a safe distance away and ask them to fix their posture, some of several settings parents can tweak (including time limits and a blue light filter) to shape their kids’ screen sessions. Huawei also threw an M-Pen Lite in with each tablet so kids can play and draw out of the box. The MediaPad M5 Lite makes some sacrifices to compensate – and to trim the price to $299, down from $319 for the baseline standard M5. Instead of a Kirin 960, the M5 Lite runs on a lower-performing Kirin 659 processor. Instead of 4GB, it has 3GB. It only has 32GB of storage (expandable via Micro SD up to 256GB). Its screen resolution is 1,920 x 1200, down from 2,560 x 1,600 in its predecessor. Does it matter? Only if you would need the extra performance – which kids probably won’t. But Huawei is marketing the MediaPad M5 Lite as a sort of middleground tablet that can please both parents and their kids. It’s hard to imagine typical users going for a tablet that’s less powerful than its predecessor at nearly the same price point. We’ll see if the M5 Lite attracts enough buyers from its intended audience of parents. New year, new tech – check out all our coverage of CES 2019 straight from Las Vegas, the greatest gadget show on Earth.